As published on LinkedIn Influencers on April 10th, 2018. This may sound like the ultimate contradiction, but I hate the word hate. I truly do. I hate the way it sounds. I hate the way it feels. I hate the word hate. And I especially hate the fact that I can’t seem to avoid it these days. Politically and socially this word has seeped into our collective consciousness at an alarming rate, and while a lot of people have spent countless hours debating how we got to this point, I’m personally far more interested in how we move forward from here. How do we bridge this ever widening gap to find common ground and work together to move this country, and the world, forward? Clearly, this is not an easy question, and as such there are no easy answers, but thankfully there are people who are trying to find a way forward. 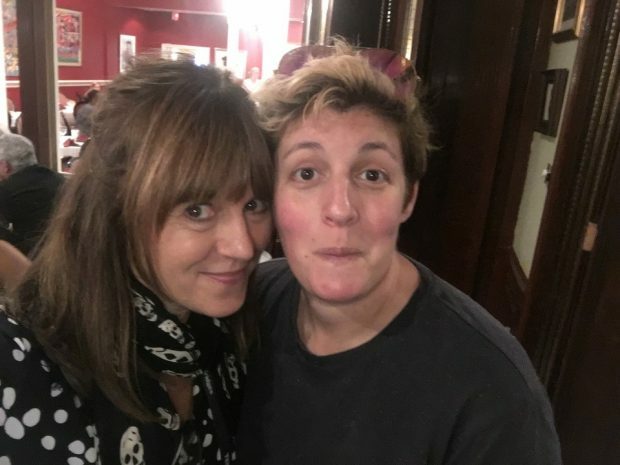 One such person is Sally Kohn, a political commentator and contributor to both CNN and Fox News, whose book on this very topic is available today. The Opposite of Hate examines the current epidemic of hate and its historical and cultural roots, but more importantly, it offers insight on how we can move past this bitterly divided impasse and learn to work together. I have known Sally for many years, and so when I heard that she would be devoting an entire book to the issue of hate and how we can move past it, I knew I had to pick up a copy. Sally’s writing has previously been published in The Washington Post, Fox News, USA Today, and The Huffington Post, but this is her first full book, and I encourage everyone to pick up a copy for themselves. And if you need a bit more incentive, please check out below some questions I posed to Sally prior to this book’s publication and her insightful responses. I know I’m looking forward to delving into this issue more deeply when my order arrives later today, and I hope I’m not the only one. Jacki Zehner: Hate is such a harsh and strong word that I actively avoid using it because of how that word makes me feel, and yet you chose to write a book about it. Why? What made you decide to address this topic at this point in time? Sally Kohn: I don’t want to sugar coat the hard reality of what we’re facing right now as a species. And there’s no other word for it, really. We have a problem with hate. We hate each other. And it only seems to be getting worse at the moment. Whether we’re talking about racism or misogyny or Islamophobia or anti-Semitism or extreme partisan hate and bias, we have a historical and habitual problem with demeaning and dehumanizing others based on their identities. A problem that has ebbed but more often flowed throughout the history of the United States and the world, which we’ve at times made progress on however imperfectly, but also are clearly still struggling with. Arguably it’s been worse before but still, I don’t think hate needs to be at its worst now to be bad enough that we have to do something about it. JZ: What is the opposite of hate? SK: It’s not love. Not for my purposes, anyway. You don’t have to love someone to not hate them. But you do have to understand how we’re all fundamentally connected as human beings, how in spite of our differences and disagreements — which, by the way, I think are incredibly important and even worth celebrating — we’re still more alike than not and have more in common than not. And we all want a world that’s less divided and less cruel. And the way we get there is recognizing how we’re connected, and studies show when we connect with people outside our own bubbles, the people we think of as “other” we hate them less. The opposite of hate is connection. JZ: I love that answer and I could not agree more. The opposite of hate is connection. Thank you. So how did pursuing this topic change you and your worldview? SK: You’d think that writing a book about hate would be really depressing, and of course parts were, especially coming to terms with our profound history and capacity for cruelty. But honestly, I walked away from the process of writing this book feeling more optimistic about humanity than ever. Sure we have the ability to hate, but we also have the ability for stunning kindness, for forgiveness to a degree that I never thought imaginable, for seeing the best in others in spite of every excuse not to. When I met former terrorists and ex-neo Nazis and people who had participated in heinous genocides who had somehow managed to leave entire lives of hate behind, that left me feeling more inspired and hopeful about human beings than I ever imagined possible. We all have the capacity for great hate, but we also all have the capacity for its opposite — and, to me, it’s that positive possibility that makes us all so remarkable and full of promise. JZ: You have spent a lot of time working as a social and political commentator on various news channels. What is your take on the current state of our news media? How has the relationship between the news media and the government changed since the last election? SK: I’m deeply worried about the state of truth and fact in our world today, which I still believe in the power of journalists to defend and promote, but has obviously been deeply undermined. And in addition to each of us as individuals standing up for facts and real news, there’s a role that government I think needs to play in working with the media, in a cross-partisan fashion, to make sure that we the people have access to the facts and information our democracy needs. In addition, I also worry that the news media helped create this moment in part by sliding away from an emphasis on reporting toward over-emphasizing opinion and debate — a dynamic, by the way, I still play into. And I think it’s important there be spaces in media for discussing and debating opinions. At the same time, I worry when news media starts to borrow too much from sensational reality television… and then we elect a reality TV star President and it comes full circle. JZ: Increasingly, Americans are dividing up and self-sorting themselves into groups and spaces where we are constantly surrounded by people who think alike and hold the same opinions as each other, particularly in the online spaces. What are the dangers of this division? How do you think this is effecting our ability to engage and connect with people who think differently about important issues? SK: I’m an opinionated person. I literally have opinions for a living. That’s my profession as a commentator and columnist. So I want to be clear that I don’t think the problem is people having deeply held convictions and beliefs or even defending their perspectives. I think the problem is when we do so by demeaning and even dehumanizing those who don’t agree with us. And divisiveness — both conceptual and in real life — just makes the problem worse, because it’s easy to be mean to people you don’t know. And more and more of us don’t know people, don’t live around people, don’t work with people, who hold different views than we do. And then we reinforce those bubbles in the news we consume and the social media we follow. Which is why connection is the answer — making sure you have friends outside your political bubble, or at the very least following smart thinkers on social media who come from the other side of the political spectrum. And then learning how we can disagree without resorting to or reinforcing hate. If you read this, love your thoughts in the comment section. Have a wonderful day. As published on LinkedIn Influencers on August 22nd, 2017. This summer has been a tough one for the domestic box office. The final tally for the summer is estimated to end up trailing 2016 by 12%, or half a billion dollars, and overall, 2017 has racked up about 4% less in ticket sales than last year. There were several big budget bombs, including King Arthur, Baywatch, and The Mummy, and under-performing franchise instalments such as Transformers: The Last Knight, Pirates of the Caribbean: Dead Men Tell No Tales, and Alien: Covenant. And then there was Valerian and the City of a Thousand Planets, which is shaping up to make just over half its budget back, even after accounting for the ever more lucrative foreign box office. This is not to say that the summer didn’t have its bright spots. Guardians of the Galaxy Vol. 2 got the summer off to a rousing start (loved it), and Spiderman: Homecoming managed to score both critical acclaim and box office success despite the fact that this was the character’s third reboot and sixth film in 16 years. However, the brightest spot on the summer calendar was easily the release of my favorite film, one that I’ve seen four times now and love it more every time: Wonder Woman. Wonder Woman roared onto the big screen on June 2nd, and began breaking records on its opening weekend when it became the highest grossing opening weekend for a film directed by a woman. Since raking in over $100 million that first weekend, Wonder Woman has gone on to gross over $404 million domestically and over $800 million worldwide. It’s the highest grossing film by a female director ever, and its total domestic gross is not only the highest grossing DC Extended Universe film, it’s also the top grossing superhero origin story film in history. That’s right. Wonder Woman has outgrossed the debut films of Iron Man, Captain America, Batman, Superman, Thor, Guardians of the Galaxy, and every single X-Men film released to date. Just for good measure, she’s also outgrossed the domestic take of every single Harry Potter film and Frozen. That’s right. Wonder Woman outgrossed FROZEN. Not only did Wonder Woman burn up the box office competition, but she arrived awash in critical acclaim and glowing reviews. Sporting a 92% on Rotten Tomatoes and drumming up great word of mouth, Wonder Woman is slated to be the most successful film of the summer. The only film to outgross the Amazon princess in 2017 is the Emma Watson-led Beauty and the Beast that was the hit of the spring, meaning that the top two grossing films of the year so far are female driven hits. If this does not get Hollywood’s attention to initiate more female led content I don’t know what will. I’ve made no secret over the years, the many, many years, about my unabashed love for Wonder Woman, and I couldn’t be happier that not only did she finally arrive on the big screen this summer, but she did so in a great movie that was worthy of the character I’ve loved since I was a child. Wonder Woman‘s release also gave me an excuse to let out the inner fangirl in me. As a collector of memorabilia for over 20 years, I finally pulled everything Wonder Woman together in one place, and holy moly. I had pieces here and there around my house, in my closet, packed away in bins, but I had never put it together in one place. When I did, even I was shocked! I ended up doing a local television spot around the collection and the film’s premiere here in Utah, which then got picked up on NBC National News. My collection, by the way, is set to increase tenfold, as this film’s success has led to a boom in Wonder Woman related products. Recent additions for me include a cool WW Bomber Jacket, salt and pepper shakers, and miniature iron clad characters. Wonder Woman will soon wrap up her first big screen run, and it couldn’t have gone better for a film with so much pressure, anticipation, and stakes attached to it. My lifelong dream of seeing a Wonder Woman film, a great Wonder Woman film, has been achieved, and now all there is to do is sit back and wait for the sequel that’s coming in 2019. Not to mention her appearance in the Justice League film that is due to arrive in November. Can’t wait for that. So you may be thinking to yourself, “So what? Why does any of this matter?” My answer is multifold. 1) This film made history. In a world where only 7% of the top 250 grossing films of 2016 were directed by a woman, this film’s success shatters the celluloid ceiling. Trust me, I wish I lived in a world where we had something close to gender parity in the film and content industries, but we don’t. The reasons for this are multifold and I invite you to dig into the research if you are interested. My best reports list has a robust section on arts, entertainment, film, and media. So the fact that this film was so successful matters to the industry as a whole. 2) The film showcased what can be accomplished through consumer power. Fans of this character waited decades to see this film, and we proved that not only will we show up, but so will broader audiences when the buzz is strong. What really helped this film perform so well was the momentum of passionate filmgoers, those who did theater buy-outs (I did, photo from the kick-off party above), posted on social media, wrote reviews, and so much more. This is all clear evidence of the power of the purse! 3) The message. I don’t know about the rest of you, but I wake up most mornings anxious and sad about the state of the world. There is so much hate and so much anger out there, and what my favorite character gave us on the big screen was the complete opposite. Though we may not have HER superpowers, we all have superpowers ourselves. We make choices every single moment of every single day on how we show up. Do you lead with love, with compassion, and with the intention to make the world a better place? Or the opposite? What we see on screen, any screen, affects us, and we need more characters like Wonder Woman and more content that lifts up, not pulls down. She is inspirational and I believe that matters. 4) It’s personal. Today I am packing up my collection, leaving a few pieces around the house on display, but clearing off my downstairs table where the collection has been on display for the past few months. So many times I have gone down there and just sat and stared at all those items thinking about my journey to become a champion for women’s rights and inclusion. 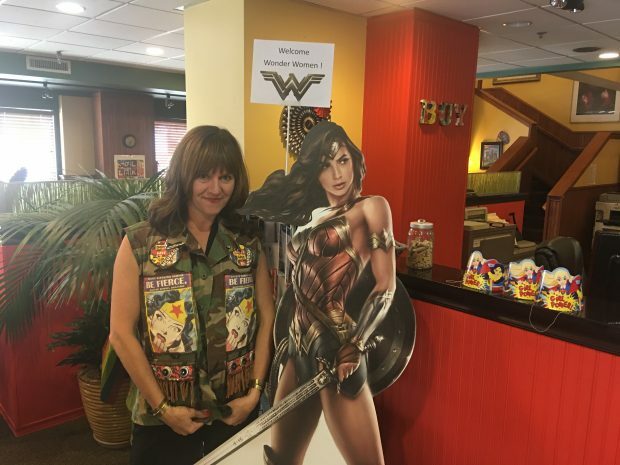 My origin story with the character can be read here, in my Wonder Woman report, but the reason why collecting has meant so much to me is because it has paralleled my life’s journey to activate my power – my financial resources, my voice, my influence – to make the world a better place. Wonder Woman has been with me every step of the way. So this will likely be my last post on Wonder Woman for a while, as yes I am capable of writing about other things, but if you did see the film, take a second to reflect on your favorite scene. If it happened to be the No Man Land’s scene, that was mine too. I have the honor of knowing a very special man, Jim Greenbaum, and on the bottom of his emails he has this quote: “Being a bystander to suffering is not an option.” To me, this perfectly summarizes the character of Wonder Woman. If every one of us felt that way and did something, and then did something more, maybe our world would indeed become a better place. For fun, here is a summary of the media/press I was featured in around the time of the film’s release.